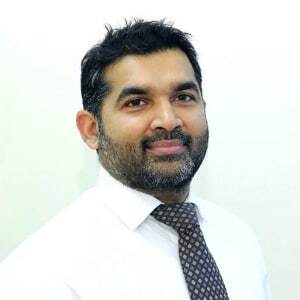 Dr Elangasinghe is a Consultant Dermatologist who specialises in adult and paediatric dermatology at Salford Royal Hospital NHS Foundation Trust, Manchester (rated best NHS trust in UK ’17 and ’18). Following completion of MBBS in 2001 he has worked in various parts of UK (Ayrshire, Mid Wales, Yorkshire, Norfolk and Leicestershire) as part of his medical and specialist training. He completed UK medical physician training by obtaining the Membership of the Royal College of Physicians in 2007 (MRCP). During these 6 years he gained a vast amount of general medical experience (including intensive care, cardiology) which is a bit more than routine training and he is renowned for this expertise in medical dermatology as most skin conditions/ rashes have connections to internal medical problems. Having obtained Joint Royal College Training accreditation in 2010 (MRCP Derm UK) he was appointed as a full time NHS consultant in Dermatology in 2011 as soon as his training was finished. He was appointed a fellow of the Royal College of Physicians (FRCP) in 2014. Vinod has authored many publications in Dermatology and presented at national and international conferences. He maintains the most up to date knowledge and experience in treating skin diseases ranging from skin cancer to rashes (inflammatory skin disease). He also has a special interest in science and the biology behind hair disorders. He is a clinician who uses a mixture of most advanced, novel treatments along with older well trusted ones in providing patients with a range of treatment options. He is also known for his ability to explain complex medical problems in a very understandable way to the patient and plan treatments together. A GP letter is not essential to see him but a comprehensive history of the condition, relevant and non-relevant past medical history and all medications current and past are hugely appreciated in order to give the best treatment plans. Some of the words and phrases used by his patients to describe him are “friendly, understanding, very thorough, neat and meticulous, caring, has time for you, always with a smile”.